The key to remaining competitive in automotive industry is to provide excellent order fulfillment through efficient product delivery. This is true for the entire B2B sector involved in the supply chain, always required to deliver just-in-time and just-in-sequence. Dimac – keeping pace with the most demanding market requirements – is committed to provide customers with turnkey solutions, that means also broad portfolios of maintenance and aftersales support. Including a comprehensive, targeted service for the optimum availability, traceability and delivery capacity of its machines’ spare parts. Particularly on this point, Dimac is further implementing its intralogistics system with an innovative warehouse technology that develops a smart, extensive, close-knit logistics network. GM Massimo Agrati says: “Our customers are active all over the world and solutions must be readily on hand. Nowadays, timely delivery is no more a plus but a must to remain competitive and play a key role in a crucial segment for car manufacturers as fastener industry is”. The warehouse management is closely connected to the overall company’s management, e.g. production supply, sales, distribution and on-site servicing. Giuseppe Mastrandrea – Logistics Manager at Dimac – explains: “We are planning to integrate our automated vertical carousel storage with robotics and IoT elements to make the unit-load system more and more dynamic, quick and efficient. This will improve our productivity as well as the spare parts consignment”. On the one hand, production benefits from a perfectly working inventory, continuously monitoring the total amount of stock available for the machines manufacture. On the other hand, customers are real-time assured of the shipment and delivery promptness for any spare part needed. The vertical automatic storage system is served by a lift device and its configuration allows the positioning of drawers at varying heights, depending on the type of load unit stored. A series of numbered shelves, working on wheel concept, rotates around a track to deliver the stored items quickly to an ergonomically positioned work. Giuseppe continues: “Shelves are configured to create a storage system that maximize storage density, allowing at the same time the easy management of picking lists by rapid access to the archive consultation”. The stocked material is basically shared in mechanic and electric: the former warehouse is based on the purchase orders, allowing Dimac servicing to be predictive, reactive and proactive to the customers’ requirements as well as to the production needs. The latter is conceived on a minimum and safety stock, held to guard against any stock-out. 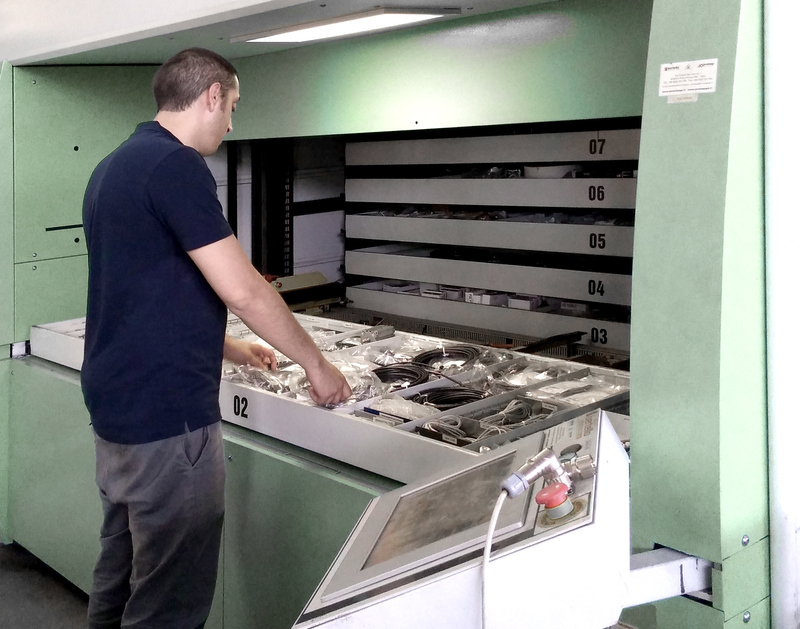 “Our ERP system integrates the inventory management software” Giuseppe goes on “easily identifying the exact location of the pick and displaying additional information such as quantity to pick, part number and part description”. R&D is working to include the very heart of Dimac’s logistics process in the brand’s state-of-the-art, cloud-based eco-system. Mr. Agrati concludes: “This will allow us to optimize the material flows and the spare parts handling, giving an optimal ratio between performances, work times, elimination of errors, storage control and traceability of materials and operations”. Dimac announces that the new headquarter will host a wider logistics area with additional vertical automatic storage systems. Automotive OEMs leaders rely on Dimac expertise to improve their production processes, by means of the most advanced inspection & sorting technology as well as a first class logistics approach.